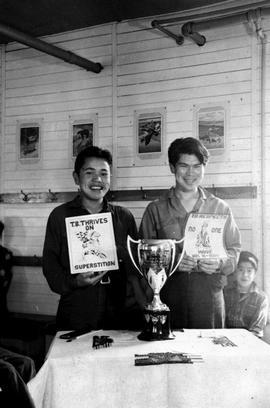 Alert Bay; tuberculosis poster contest winners; "TB Thrives on Superstition" and "TB Respects No One - Have An X-Ray"
Medical services in Vancouver, 1886-1920. v, 285 leaves: fig., tables. Thesis (Ph.D.), University of British Columbia, 1979. Bibliography: leaves 259-285. Vita. Canadian theses, 46062. Fight the flu! 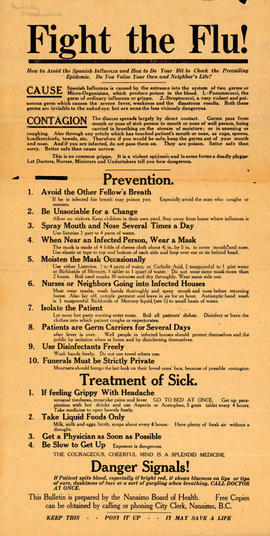 How to avoid the Spanish influenza and how to do your bit to check the prevailing epidemic. Do you value your own and neighbor's life? Pamphlet about the Spanish Influenza; published by the Nanaimo Board of Health. Business records of the Halcyon Hot Springs Sanitarium Company: Vol 1. Register, 1897-1910; Vol 2. Ledger, 1898-1904; Vol 3. Journal, 1895-1905; Vol 4. Cash book, 1897-1902; Vol 5. Cash book, 1902-1905. The fonds consists of Gerry's amateur films depicting her experiences as a public health nurse in First Nations communities around B.C.